The ProTherm Quantum system is made up of Vacuum Insulation Panels (VIP), accompanied by thermoset infill boards which are designed to cut and fit around penetrations and curved upstands. With the limitation of traditional products it can be difficult for a designer to insulate above a habitable space against the backdrop of increasing thermal requirements. This, together with the desire to maximise the glass facade and cater for a level threshold has created a near impossible task, now made easier with Quantum. A ProTherm Quantum Hybrid inverted roof system is our most popular solution. 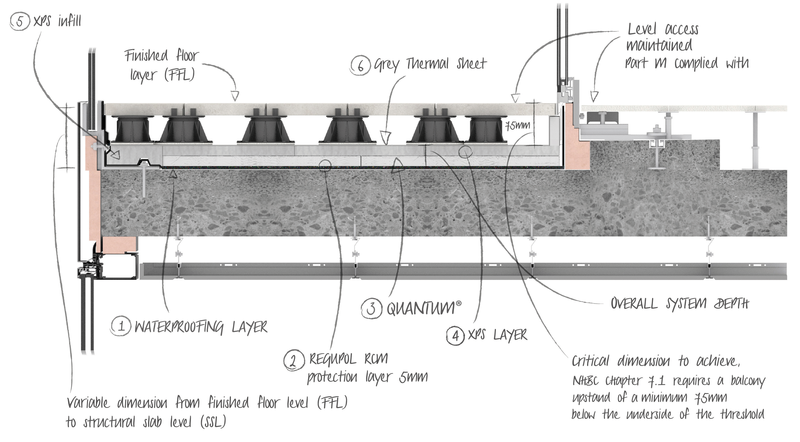 Using a combination of both XPS and Quantum we can normally supply an exceptional thermal outcome without compromising the internal upstand and deliver the ability to maintain a level floor between both internal & external spaces. Click here for BBA Certificate. A ProTherm Quantum Pure inverted roof system is the thinnest solution possible where the severe lack of space calls for using just the Quantum panel. Even in these challenging conditions this system will offer outstanding results. See our U-value calculation chart here. Central to both systems’ outstanding thermal performance is the Quantum Vacuum Insulation Panel (VIP). Manufactured in a UK based, state-of-the-art production facility, the Quantum VIP panels achieve an aged thermal conductivity design value of 0.007 W/mK – the thinnest possible inverted insulation solution available today. Consisting of a microporous fumed silica core, evacuated of air and moisture prior to being encased and sealed in special, gas-tight, aluminium foil, Quantum VIP panels are manufactured in a range of sizes and thickness to enable installation as complete boards. This helps ensure optimum thermal performance is achieved across the balcony/terrace area. Where penetrations are required, or where infilling is necessary to accommodate a specific shape or size, thermoset boards can be used. These are manufactured to the same thickness as the Quantum VIP and are easily cut to suit detailing or infill areas.